We have started canning with the Oktoberfest seamer and this filler. As you can see, it is a 4-head counter pressure bottle filler. I got it a while ago and have bottled a number of specialty bottle releases on it, and continue to use it for that. However, I made some modifications to adapt it to canning and am not utilizing the counter pressure feature. 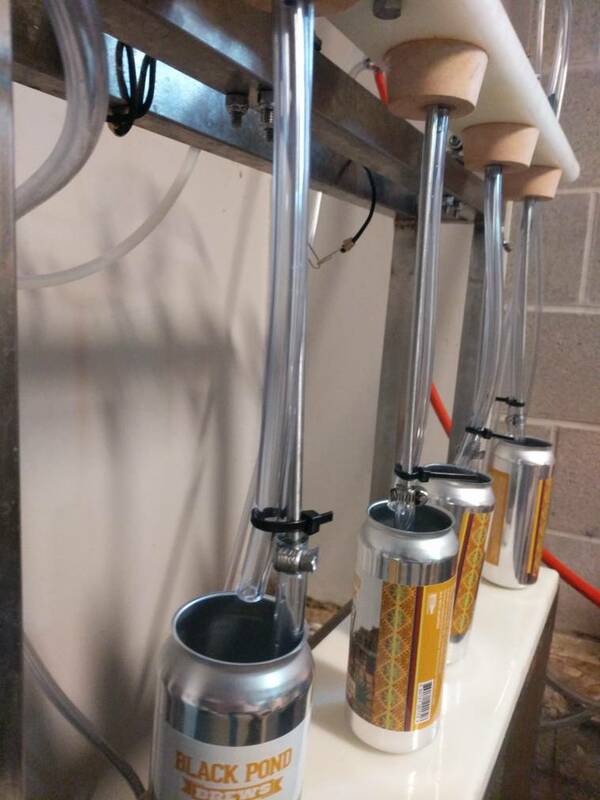 I lengthened the fill tubes by adding vinyl tubing that is more flexible to allow us to pull the cans out without tipping them too much. So far, we have run three packaging sessions on it. One was an IPA, the other two were not. The non-IPA runs have held up fine, but we are getting oxidation in the IPA cans, with inconsistent levels. Some were fine, some were heavily oxidized by 14 days, and some in between. The IPA was also our very first run; our next runs were non-IPA and went more smoothly as we were more accustomed to the setup. I am thinking about doing two cans at a time instead of four for IPA, and keeping our beer gun hooked up to CO2 to fill the headspace just prior to seaming. If anyone has any experience making a system like this work, or any feedback on how to optimize this setup I would greatly appreciate it. I like this setup because it is easy to run, it cranks 4-packs out at a fairly quick pace, and of course, I've already spent the money purchasing it. So I'm hoping for advice on how to use this setup first and foremost. Would it be better to utilize the counter-pressure? Anything I'm overlooking? Last edited by wlw33; 02-06-2019 at 09:59 AM. That is an inadequate setup for canning. You will be plagued by oxidation issues until you get something that can protect the beer. If you think about it, a bottle has a tiny opening for which oxygen exchange can happen, it is more difficult and you can blow out the head space right before capping without harm. A can on the other hand, has a huge opening, and is filled more or less to the top, no way to purge it out again. Cood canning machines are either counter pressure fill or atmospheric fill, but the time from when the filling stops until the lid is in place is short, like less than a second short. In situations where it is longer, good units have a tunnel that constantly has CO2 or Nitrogen flushing through it to keep oxygen out. Your best bet for making this work at all is to only fill one can at a time so you can get a lid on asap, like filling a crowler. Even with this, you will probably have some oxidation issues. Hand canning for any volume is not a good idea. Sorry to burst your bubble, but I would let that equipment be for bottling and then save up and get a small, automated canning system. Looks like this guy built a kinda manual version of a can filler. Might be a good place to start. the filler in that video does not have bottom sealing valves, so when he raised the heads up the liquid in the tubes would slowly drip out being displaced by air- still not so great. How are you purging prior to filling? It looks like your co2 is dangling in the air or is that just the vent tube in which case how are you purging with CO2 even when bottling? You need to purge with co2 from the bottom up at about 8psi, then preferably have some foaming when the lid is placed but make sure the cans are full. With the oktober seamer you can force it to foam a bit prior to the seaming operation. Don't expect crazy shelf life but it should do better than what you have. I have built a small manual canner that works alright similar to the cask mcm. Have also seen someone that had made a counter pressure unit for canning that looked pretty interesting. The co2 purge comes from the same line as the beer does. You turn the co2 valve on to purge, then shut it and open the beer valve to begin filling. I've got one of those, but ultimately ended up just using a beer gun for small runs of cans. I do have a beer gun but man after a few cases it really starts to cramp up the hand. Running an IPA through the setup in a few days, hoping the modifications I made will make a difference. Just had a can of IPA from our first run that actually held up so I know it's doable, just gotta mitigate as many problematic factors as possible.